Do you love cooking and you have been searching for a quality and affordable air fryer which you can use to prepare healthy and delicious meals? This article is all you need to read. It is a comprehensive review of big boss 16qt oil less fryer which is a very advanced air fryer as compared to the rest. Big Boss Oil-Less Fryer is an excellent appliance for all those who love deep fried foods. Gone are the days when people used pans with oils at the bottom. Big boss fryer is a no oil fryer. It removes dangerous agents such as fat from your food. With this, you can prepare two meals at the same time using the two trays provided. Read on to find out other features that confirm Big Boss Air Fryer is the best air fryer you can purchase today. Why do you need Big Boss Oil-Less Fryer? We all know that air fryers use rapid air technology whereby hot air is circulated around the food basket. Big Boss Oil-Less Fryer is a bit different because it uses three types of power. That is the halogen, infrared and convection modes. Halogen – The food surface is heated directly, which gives it a nice roasted flavor. This makes your food color to turn brown. Infrared – This cooks and heats your food from inside and out. It gives your food an excellent taste and ensures it remains juicy even after roasting. Convection – Hot air is moved around the fryer and is equally distributed around your food which makes cooking to be fast. This combination makes the food to be very delicious and crispy on the outside. You do not need a lot of oil when cooking. You can cook three times faster as compared to those who use other fryers. Big Boss Oil-Less Fryer measures 16X 13.5X12 Inches and weighs 14.7lbs. Unlike others, this one is set up in a way that allows you to prepare two different meals at one using the two trays provided. Cooking controls are located at the top of the lid; this means you can read and press them easily. Big boss 16qt oil less fryer also comes with tongs, recipe booklet, and an oil sprayer. Big Boss Oil-Less Fryer contains two dial knobs at the top which allows you to set your desired temperatures up to 500 degrees. You can also set your preferred frying time. These deals are good, but they are not as accurate as digital dials. oil less fryer has a standard temperature range since the device uses the triple cooking power through halogen, infrared and convection heat. Big Boss Oil-Less Fryer allows you to prepare different types of foods. You can cook anything from chicken, veggies and even fish sticks. The only problem with this is that the various types of food may not include e fried evenly which makes it hard to prepare some of the foods recommended in the recipe booklet. Some of the foods in the recipe booklet may require more heat while others need less to turn out better. Ensure that you have turned off the electric connection before cleaning. Allow it to cool and then clean the glass bowl, the ring, base, cooking racks, mesh basket, tongs and the sprayer. Give it some time to dry. You can place the glass bowl and dish racks in a dishwasher. Make sure you do not soak the cooking racks in water for a long time. If you wash, it is good to dry them using a cloth or towel. This will ensure the racks lasts for a long time. Ensure all the parts are dry before use. The cooking basket is big enough to accommodate your food. You can place different varieties of food inside. Unlike other fryers, Big Boss Oil-Less Fryer comes with two trays which enable you to prepare various types of foods. This saves your time since you can prepare different meals at once. Read Also: How Long Does It Take To Deep Fry A Chicken? Big Boss Oil-Less Fryer is ideal for people who are keen on their health. This is because it enables you to prepare foods without adding calories which result when using traditional fryers. Big Boss fryer heats the food quickly and ensures that the food moisture and flavor remains. You do not need to add oils when cooking; oil less fryer also removes fats from your food. Big Boss Oil-Less Fryer cooks healthy foods. It cooks faster as compared to other fryers. Big Boss Oil-Less Fryer is sturdy and not prone to damage. You can place it on a table and allow it to cook as you do other things. It is cheaper as compared to others in its category. You can use it to dehydrate food. You can prepare different meals at once. 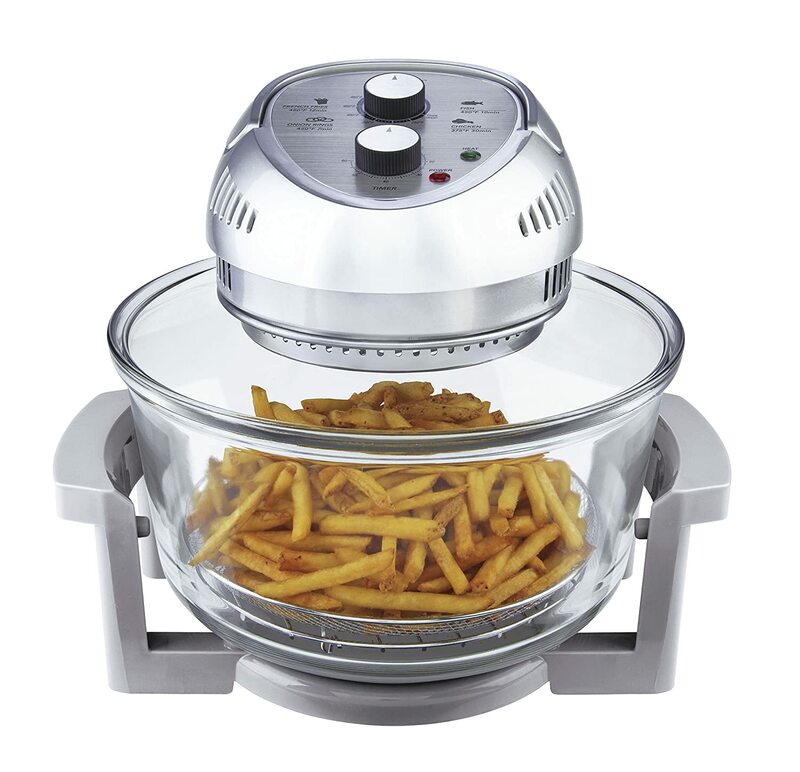 Big boss 16qt oil less fryer occupies a large space. The temperature control is not accurate. Considering all the above factors, Big Boss Oil-Less Fryer is worth to buy. 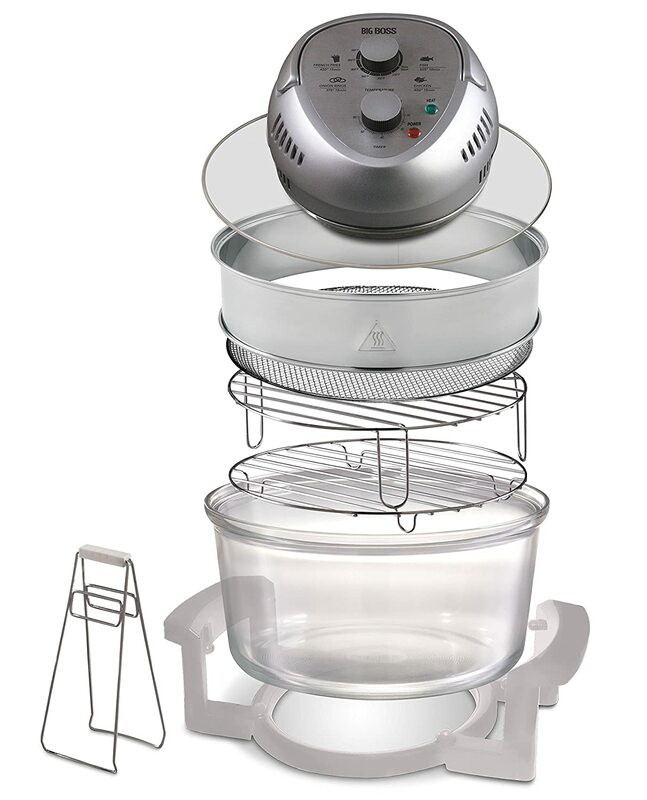 It is the best and one of the cheapest as compared to other fryers of the same niche. The fryer is an excellent choice as it cooks faster as compared to other fryers and ovens using. This fryer uses little amounts of oil, and this ensures that your food is very delicious and healthy. Unlike others, it has two trays which allow you to prepare different meals at once. It also cooks in three different modes that are convection, halogen and infrared modes which make your cooking faster as compared to when you are using other fryers. With this fryer, you are assured that you are getting a very high-quality product. It meets all the conditions of a useful kitchen appliance. You will defiantly love it. Are you wondering where you can get this fantastic product? Don’t worry, you can purchase it online, and the best place to Shop on Amazon.